How long should you continue to do CPR? It definitely depends on the circumstances surrounding the need for CPR, but continuing compressions and rescue breathing until the next level of care is available is definitely advised. According to the study linked, going longer than 30 minutes can make a difference. Update (December 27, 2016): Carrie Fisher passed away this morning at 8:55 am PST. Rest in peace, Princess Leia. Our thoughts and prayers are with you and your family. 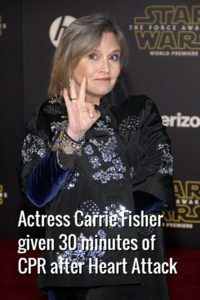 The post Actress Carrie Fisher given 30 minutes of CPR after Heart Attack (Updated) appeared first on ProCPR Blog.